The performances are exceptional. Daniel Radcliffe is our lead protagonist. It’s another daringly uncharacteristic role for the Harry Potter star. He manages to evoke a writer with a lot to say, but still unsure of how to express it. Actor Michael C. Hall interprets English teacher David Kammerer as if he were Philip Seymour Hoffman. And I mean that as the sincerest form of flattery. Honestly I would love to see those two actors as rival brothers in some agreeably turgid drama directed by David O. Russell. But I digress. The genuine revelation here is Dane DeHaan who embodies cool rabble-rousing student Lucien Carr with verve and style. He blithely rejects the writing conventions of the day with a disrespectful air that is cheeky. Yet his ideas are substantially grander than his abilities to compose. William Faulkner once said, “In writing, you must kill all your darlings.” He was admonishing authors from relying on their personal favorite elements. The title is a clever play on words as a real life murder will infect the lives of their circle. It builds to a fervid climax but that really isn’t the thrust of the narrative. The setting allows for a concentrated biographical study in a minor key. The atmosphere is rather stylish. A memorably mischievous scene occurs when the band breaks into the school library at midnight and replaces the classic works featured, with banned books by Henry Miller, James Joyce and D.H. Lawrence. First time writer/director John Krokidas further energizes this episode and others by infusing the soundtrack with anachronistic music (TV on the Radio, The Libertines). In doing so he places their philosophy in a contemporary context. Ginsberg’s in-class debates with his professor about the nature of, and need for, rhyme and meter is an amusing vignette that prefaces poems like Howl for which he would later become famous. There are limitations to the account. It’s hard to properly convey the creative process of writing in an exciting way in a movie. Someone typing furiously at a typewriter isn’t the most cinematic of displays. But more often than not, this is an entertaining story about a group of outsiders that ultimately crashed the mainstream party. This entry was posted on November 6, 2013 at 9:00 pm and is filed under Biography, Drama with tags 2013. You can follow any responses to this entry through the RSS 2.0 feed. You can leave a response, or trackback from your own site. I’m not usually a big fan of these real-life figures, hence why I felt like I was going to despise the hell out of this movie. However, it was less about them and how awesome they felt like they were, and more about the story of them growing-up, and the real-life tragedy that rounded out their lives forever. Nice review Mark. They’re not my favorite writers either, but as a character study, I enjoyed it too. But I must ask…how recent is the dot com? The dot com? I’m not sure I follow. Good review here, I really look forward to getting to this. Never once saw Harry Potter but I understand Radcliffe to be a more-than-capable, young British thespian. I really was impressed with DeHaan in Place Beyond the Pines, so there’s that to look forward to as well. Wait, hold the phone. Are you telling me you’ve never seen a Harry Potter film? However I have just seen KYD, so look for a report on that here in a bit. Great review Mark! I’m not all that familiar w/ these writers but curious to see Radcliffe and De Haan’s performance. Glad to see Radcliffe continues to leave a mark post HP, he’s made some interesting career choices thus far! They’re both great actors. Dane DeHaan was good in Chronicle and The Place Beyond the Pines but this is his breakthrough performance. He’s extraordinary. Nice review. 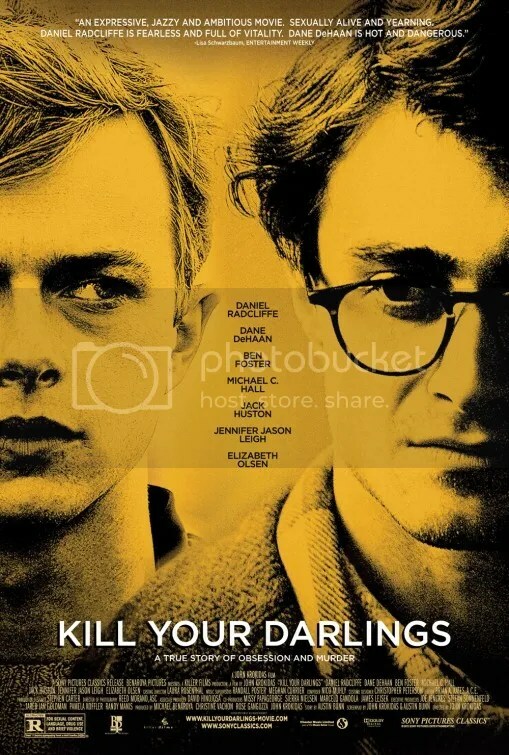 I’ve been looking forward to Kill Your Darlings for a while. Been eager to check it out. I have a feeling you’ll really enjoy this too. Great review. This is one of my most anticipated of the year, mainly because of its cast. Dane DeHaan is a great actor and I think his star will keep on rising! I agree. Next up he is set to play Harry Osborn in The Amazing Spider-Man 2. Great review, as always. I haven’t seen this one yet, but I’m looking forward to it. Just need to find time to get back to the theater. It’s nice to see it’s still expanding in theaters and slowly picking up steam. Next up is independent romantic comedy The F Word with Zoe Kazan.